Leather dog leashes are definitely a necessity when walking or training your canine companion. Let’s take a look at the benefits of these leashes, as well as some information about other equipment you’re going to need. Although you’ll find other options in your local pet store, leather dog leashes do provide a wide range of benefits. First, they are less likely to injure an owner. Nylon leashes can be painful to hold, especially if you are trying to control an excited dog. Retractable dog leashes have been known to cause severe injuries to owners, including the loss of fingers and even blindness. Leather is also more durable and is likely to look good for longer than nylon. The only exception is around water. Water and leather dog leashes are a bad combination so if you take your pet swimming often invest in a nylon leash for those outings. 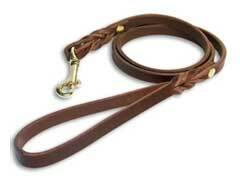 While choosing a leather dog leash is a good first step, you’ll also need a collar. When browsing the selection of dog leashes and collars, you should know that a few options are available. You can choose the traditional collar, probably in leather to match the leash. These collars work fine for training in most cases. If you have a dog with a small neck or respiratory problems, you might be better off with a harness. The harness lets you correct your dog without potentially damaging his trachea or aggravating his health condition. Some dogs do well with halter collars which give owners more control. Because of the way it fits on your dog, you have control over his head movements and that means you also have control over his body. Pronged or choke collars can also be used for training but should never be left on your dog all the time. When you are shopping for dog collars and harnesses to go with your leather dog leashes make sure to pick products that are in good repair and of high quality.